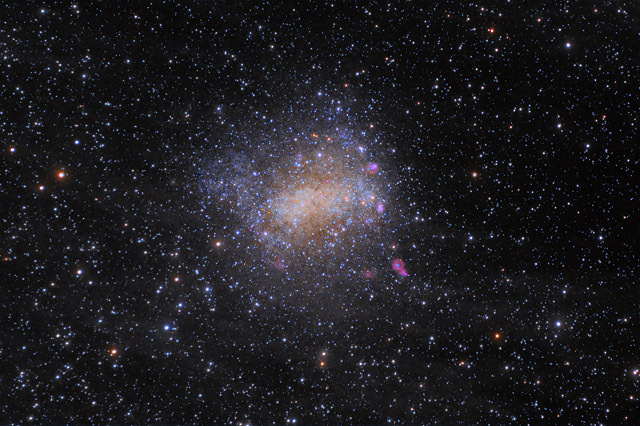 NGC 6822 (aka IC 4895) is an irregular dwarf galaxy that is a member of our Local Group of Galaxies. The galaxy contains a mere 10 million stars - a very small number compared to the Milky Way Galaxy's estimated 400 billion stars. E.E. Barnard discovered the galaxy in 1881, earning this galaxy the distinction of being named "Barnard's Galaxy". This image also captures some of the very faint Integrated Flux Nebula (IFN) in NGC 6822's neighborhood. This subtle nebulosity can be seen mostly along the bottom of the image. As a result, this astrophoto displays an interesting juxtaposition in the sky - Most of the brighter stars in this image are within our Milky Way Galaxy. Then, as we leave the body of our galaxy, we come across the Integrated Flux Nebula in the outreaches of our galaxy. 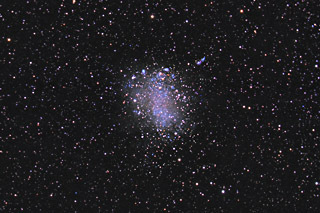 Finally, as we head farther out, we see Barnard's galaxy - a member of our Local Group of galaxies. In this image, North is to the right. This image is cropped to 66% of the original full frame. Software Used Images Plus 6.0 for camera control, Images Plus 6.5 for calibration, stacking, ArcSinH stretching, adaptive Lucy-Richardson deconvolution, star size reduction, edge masking, masked stretching, and selective color mask generation. Photoshop CS5 used for levels and curves, lab color, saturation adjustments, selective color, match color, high pass filter, narrowband colorizing and stack blending. Gradient Xterminator for gradient removal. Carboni Tools for additional noise reduction and smoothing. HLVG for additional color correction. Registar 64 for subexposure alignment. Focus Magic for focus restoration. Notes There are relatively few images that capture the IFN in the neighborhood of Barnard's Galaxy, so I'm glad that I was able to bring out this faint feature. Processing this image proved to be rather tricky, as the IFN is extremely subtle in this area, plus I had some problems with my data. Unfortunately, I was having problems on several nights with my camera rotator allowing the camera to tilt in the focuser. The problem was most pronounced with my color data, so it created some trouble with aligning the color channels. On balance, I'm pretty happy with the final result, as I have some good resolution in the galaxy and an overall pretty nice look to the image.